"If you want to mock our Christian values, come down here to Alabama and do it man to man." Late night host Jimmy Kimmel has accepted Republican U.S. Senate candidate Roy Moore's invitation to meet him in Alabama. Moore's invitation stemmed from a Twitter fight with Kimmel Thursday. Moore took issue with Kimmel's show sending a comedian to crash a talk Moore was giving at a south Alabama church Wednesday night. Comedian Tony Barbieri heckled Moore with references to allegations of sexual misconduct against Moore involving teenage girls. Moore tweeted to Kimmel Thursday: "If you want to mock our Christian values, come down here to Alabama and do it man to man." Kimmel replied: "Sounds great Roy - let me know when you get some Christian values and I'll be there!" Sounds great Roy - let me know when you get some Christian values and I’ll be there! On his show Thursday, Kimmel promised to come to Alabama to either talk about Christian values or fight for charity with the money raised going to Moore's accusers. Alabama Senate candidate Roy Moore's communications director, John Rogers, has resigned, as Moore continues to deny any sexual misconduct against underage girls. 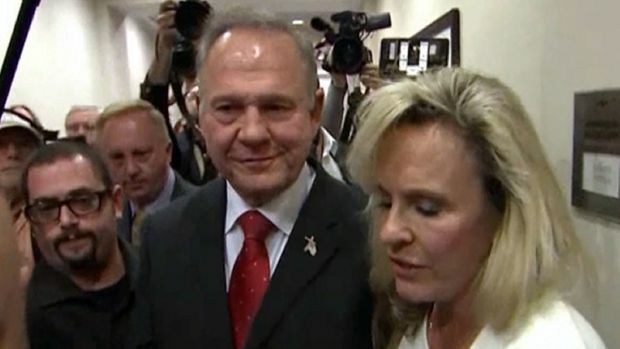 In a new interview, Moore again denied the allegations against him, and now it appears he has the president's backing.